Nintendo president Satoru Iwata reminded attendees of the company's financial results briefing that it does not employ a powerful deity, as famed Nintendo game designer is not, in reality, a god walking the Earth. Iwata was forced to remind the crowd of Miyamoto's non-divine status when questioned about a few of Nintendo's more recent stumbles. That includes Wii Music "not selling very well," declining Wii hardware sales and a series of "small mistakes" from the company, including buggy and delayed software. "One of the reasons why Miyamoto is highly praised is because of his ability to stop, rethink about, and fix how he can convey the appeal of a software when he finds out during the latter phase of development that the software will not be good enough," Iwata said. "This is why the games he has worked on have a high batting average to produce big hits." 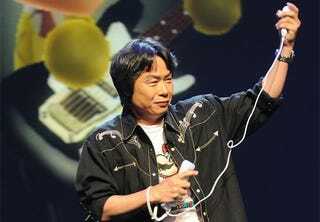 "However, he is not God and even Miyamoto himself cannot hit the mark every time nor always predict how long it takes to complete development," he added, a statement which would fly in the face of the opinions of attendees of Nintendo's E3 2004 press conference. But Iwata seems to be taking these criticisms to hear. Iwata sums up: "We are making efforts to not miss out on great opportunities. We are always searching for the next fun thing. With luck and some preparations, we hope to identify and catch these opportunities when they appear in front of us. However, no one can tell when these will comes to us, and it is inevitable that we may not always be able to launch our products at the most desirable timings."